The contractual data you enter into Consonance – such as the length of the term, the signatories, delivery dates, royalty rates, the advance payments, the reserves against returns, and so on – combines with a contract template in the system to generate a PDF contract. Download and send this via email or post for signature, to form the agreement between you and your content license holders. Additionally, read how to add a contract template. Here is the PDF of an example resulting contract. What if I don’t want to use Consonance to generate the contract document? If you prefer to create your contracts outside of Consonance (e.g. within a Word document), still enter the contractual data to Consonance. This is because the system can then reuse the data for other parts of the publishing process - especially royalties. Contract signed dates are used as the flag for whether a work is at proposal stage or not. To learn what contractual data is required to calculate royalties, see the Royalty-specific data article. Go to Work > Contract. Fill the form in. Much of the data appear in the schedules of the printed-out contract – click on the Download icon to see how you’re doing. Choose from the Template name dropdown to set the contract template. Read how to add a contract template. Use the options in the Contract formatting area to switch on and off options such as clause numbering and headings, and the inclusion of schedules. The rest of this article goes into detail, section by section, on what to fill in. 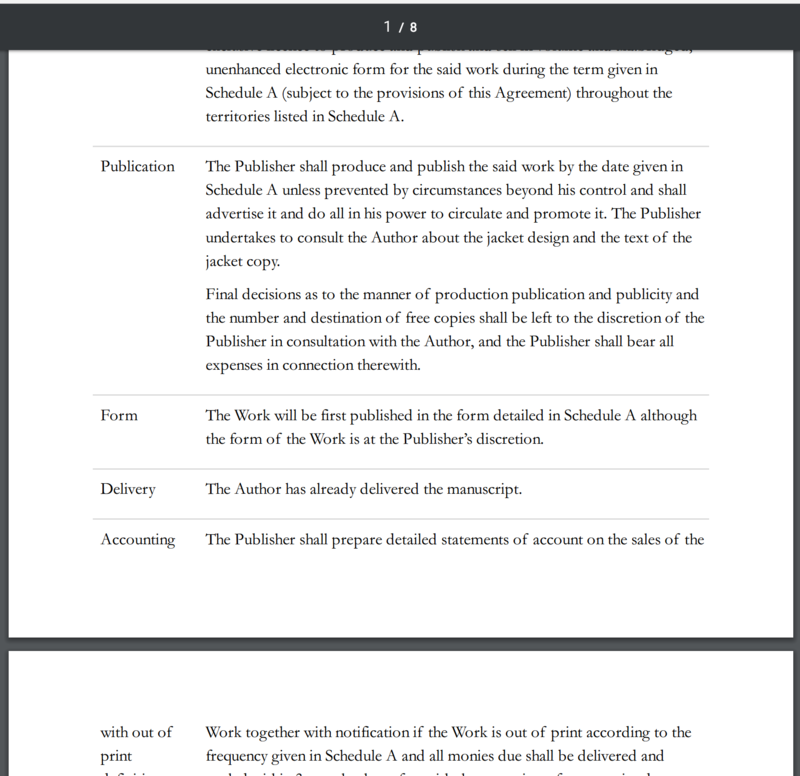 What if I can’t edit the contract – the fields are greyed out? A contract is live when it has a signed date. Once it’s live, the only editable fields are the signed date itself, the actual manuscript delivery dates, and contract errata. To edit an already signed contract in Consonance, delete the signed date and save the contract – but be aware that you are changing history and that if your author has already signed the contract, you are changing a living document. Add royalty specifiers to create as complex a set of royalty rates as you want. Enter the method of royalty calculation and the rates you want to pay for each sales channel. What is a royalty specifier? You see a visual hierarchy, with the contract at the top, then the work, then one or more products, and the channels contracted. Add a royalty specifier for every product on the contract – at either the product or the sales channel level. Choose a masterchannel from the dropdown. If there are none there, or if you want to add a new one, click on the ‘Edit masterchannels’ link. Click ‘Save’ to see the ‘Royalty’ section of the contract page. You’ve already set a base specifier at the book level. Now, override it at the masterchannel level, if you want, or leave it as it is. Where are royalty specifiers in Consonance? Royalty specifiers are viewed and modified as part of a contract. The same data that you specify as part of a contract is used to calculate the royalties themselves. What do royalty specifiers apply to? If no royalty specifier is present for a sales channel, then the specifier for the parent master channel is considered. If there is no specifier present for a master channel then the specifier for the product is considered. It is also possible for a specifier to inherit particular attributes from a parent, to modify the royalties for a particular channel in respect of, for example, the base rate, while also using the same date escalator steps as defined for the product. The notes here are also present on the page in the system itself. If you enter a percentage here, and leave all the following fields blank, this is the royalty rate for all sales. Make adjustments to this basic rate by adding in quantity escalators, date escalators and price amendments. For this and the other fields, enter the rate as a number, without the % sign. For example, if you want the rate to be 15%, enter 15. If you enter a minimum percentage rate here, this overrides any other settings. If you want to ensure you don’t pay royalties over a certain rate, set a ceiling for the royalty rate here. Set up the system to calculate royalties on a quantity escalator. This means that you pay one rate on the first, say, 1000 units, and another rate on subsequent sales. » Choose ‘Escalator (Add)’ to provide the percentage point rise for each quantity range you want to pay royalties on. The two ‘Escalator’ options allow you to have royalties calculated at different rates based on the date. » Choose ‘Escalator (Add)’ to provide the percentage point rise, for each date range you want to pay royalties on. » Choose ‘Escalator (Multiply)’ to provide a percentage by which the royalty rate should be multiplied, for each date range you want to pay royalties in. » Choose ‘List’ to have royalties calculated as a percentage of the price on the back of the book. You don’t need to enter any additional information after this: the system calculates royalties based on the list price. » Choose ‘Discount’ to have royalties calculated on the sales value you receive from customers, after their discounts have been taken off (often known as ‘net receipts’). You don’t need to enter any additional information after this: the system will calculate royalties based on net receipts. The two ‘Escalator’ options allow you to have royalties calculated at different rates based on the discount you sell at. » Choose ‘Escalator (Add)’ to provide the percentage point rise, for each discount level you want to pay royalties on. » Choose ‘Escalator (Multiply)’ to provide a percentage by which the royalty rate should be multiplied, for each discount level you want to pay royalties on. » Choose ‘Inherit’ to use the settings from the next level up. Once you’ve made the changes on this page, refresh the page to bring up a set of fields into which you add the actual rates. Add as many as you require. The licensed rights area contains details of all the rights that you’re licensing in this agreement. It also contains the percentage of revenue that the signatory will receive if you sub license any of these rights. If you want to sub license any rights, this part of the contract has to be filled in. For example, Consonance will not let you record the sale of French rights if you haven’t licensed them in this head agreement in the first place. These are the sales rights that you have for your products. There are different types of right, and for each one specify the territories to which it applies. Although you can define sales rights in terms of the territories that you can sell products in, it is best practice to also define territories in which you cannot sell the product. This list of special territories and countries helps you to check that in complex sales right specifications you have consistent sales right types within territories, if that is your aim. It’s best to store data in Consonance so that it reflects reality as closely as possible. So, if you’re going to pay an advance in three instalments (on signature, on delivery and on publication, for example), enter three separate Advance records. For example, if you’re going to pay GBP10000 in total, with GBP3000 on signature, GBP3000 on delivery and GBP4000 on publication, then add three advance records, for each of those values, with the correct trigger recorded. Once an advance has a paid date, Consonance will create a payment record behind the scenes. This is in the Payments section of the contract edit page. If the advance hasn’t been paid, make sure you do not enter a date in the ‘Paid date’ field. Record here money that you pay out to signatories. It would be disastrous to fail to record money you’ve paid out, because the system will expect you to pay it at the next royalty period – but it would be a duplicate payment. If there are complex delivery terms, such as 30 illustrations by June 20th and the rest by Christmas , articulate them here. This area provides for money to be withheld by the publisher against the risk of future returns from customers. Avoid returned sales royalty shocks! The reserve against returns is a proportion of sales that are held back from the royalty payment process against the contingency of a significant number of returns of unsold stock from retailers. There are currently two ways in which the reserve can be defined. as an agreed rate against a sales channel for a particular contract. In both cases the rate can be varied by the statement number, so that the reserve for the first statement might be 24%, for the second 20%, for the third 5%, and for the fourth and subsequent statements 0%. Go to Settings > Configuration > Channels ⤴ . Click the Edit link on the channel for which you wish to set a return against reserve rate. Under the Reserve against return rates section, click on the Add reserve rate link, and two text entry boxes appear. Consonance allows different rates to be set from specified statement numbers onwards. To set a single rate for all statements for this channel, add a ‘1’ to the first box and the required rate to the second. To specify further rates, click on the Add reserve rates link and repeat the entry of required values. You see the specification of descending return against reserve rates. Click Save, and either return to the channel list to move to a different channel. This pattern of reducing the reserve rate serves to release previously reserved royalty amounts as the contract progresses. If a total amount of GBP500 were reserved on statement 1, GBP100 of this amount would then be released on statement 2 in addition to newly earned royalties. The contributors to a work might not be the same as the signatory to the contract, so enter contributors to the contract in the Payees section. Upload signed scanned copies of current and past contracts in the Attachments section, as well as addenda and other attachments not provided for in Consonance e.g. series heads of agreement, or option documentation. A contract template provides the clauses of the contract, which you set when you choose from the dropdown labelled Template name. Read how to add a contract template. However, if you need to be able to tweak the clauses for your work, use the Contract-specific clauses section. Click to duplicate a contract template’s clauses, then edit the clauses directly. Add a brand-new clause in: click the Add + button. Remove the contract template choice from the Agreement section, unless you want the template clauses to print out too. If the contract has already been signed, but you need to make a change, add an errata. Record how many copies need to be sent out, to whom.